Without really being conscious about it I realise that I like the form and colour of the old cast iron post boxes. During the times I have been on holiday in England I tend to have pictures taken on them and they remind me of my youth where I stayed in Manchester and wrote letters every other day and were glad they were emptied so often. We were not using phone calls as that was very expensive and too emotional. We didn’t have any social medias or the internet. One so-called Pillar Box has a special story. It was the only thing that remained unharmed at the IRA bombing at the Arndale Shopping Centre in Manchester in 1996. I was looking for it the other day, but it is covered while road reconstruction is being done. The Victorian Pillar Box is from 1886. Very solid indeed. You see also Post Boxes from the Victorian times as Wall Boxes. It is shown in one of Beatrix Potters lovely stories for children (and adults). It was cheaper to make them as wall boxes. This one I found at a small village also in the Lake District. It seemed that it was emptied twice a day which is unheard of in Scandinavia. 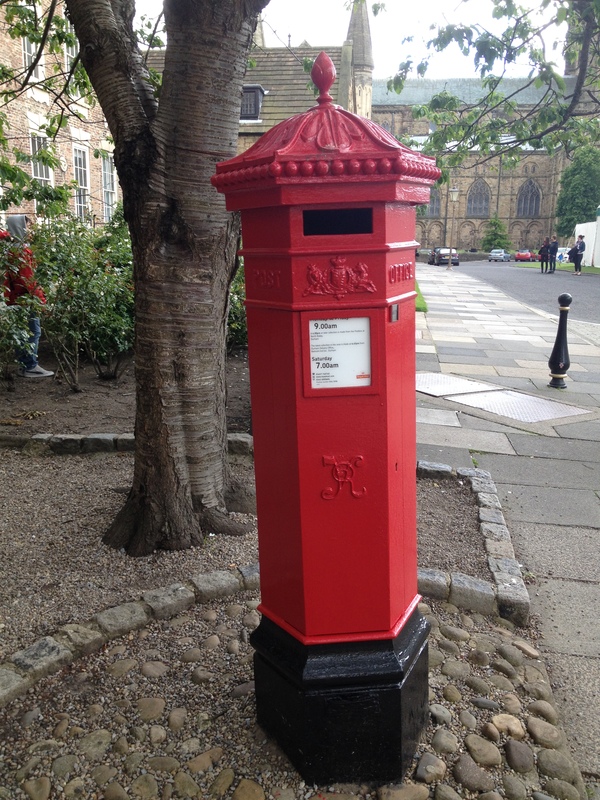 Old Pillar Box from at Durham U.K.
What a lovely post (box). Thank you for sharing your memories and the splendid pictures. Oh, the stories that these special boxes could tell. What I enjoy mist about being a blogger is connecting with other bloggers who write and share photos about their life experiences. I enjoyed the photos of the boxes and your relationship with them. You are so kind to write this. I feel the same thing and find the blogging fellowship very encouraging. The boxes are so cheerful. Perhaps England is not suffering the same decline in the written word as the U.S. is. Very sadly, 1900 people are losing their jobs across Australia, as Australia Post downsizes, due to emails, texts, social media. And no doubt they will increase the cost to post a letter. I still love sending birthday cards, and my daughter loves the ‘surprise’ an envelope addressed to her gives. In the future I doubt kids will know how to send ‘snail’ mail! I love postboxes and telephone boxes too – they are becoming quite rare. What a lovely post. Some of the old phone boxes survive as mini lending libraries. People fill them with books for other folks to borrow. 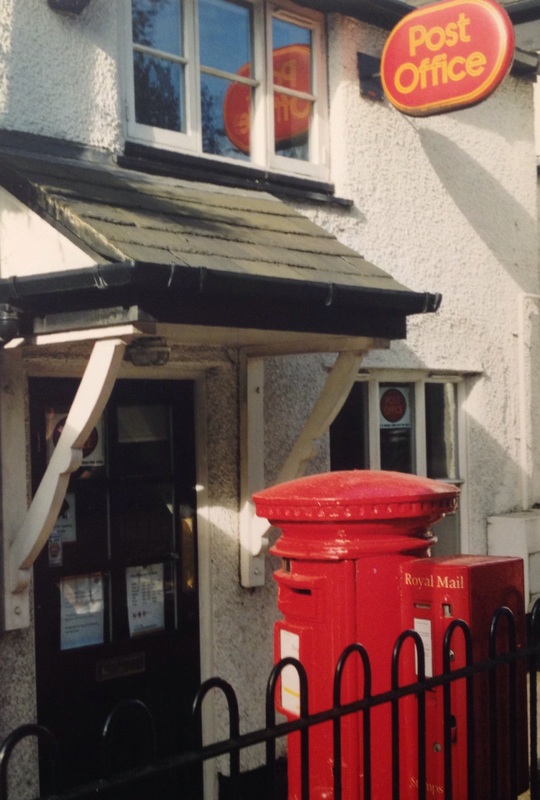 We had a wall post box in the village in Berkshire where I lived as a kid so your photos brought back lots of memories. All those overseas pen friends I had! Like TechShroom, I also love the old phone boxes but I think they’ve mostly disappeared now. In Montreal the old post boxes have all been replaced by messy looking angular boxes – such a shame. Even worse, home delivery is going to stop very soon and people will have to go to a community stack of boxes (grey and ugly) to pick up their mail. For many people this will be a great hardship – and will probably mean Emergency at the hospitals will be busy with broken bones from falls on ice in the winter. Thanks for this post.